Our new 1080p HD Black and Silver Pen with 16GB Storage pen is the perfect on-the-go recording pen. The small pinhole camera can be used secretly by law enforcement, or for personal covert missions. Students can also use this camcorder to record their lessons and tutorials. The adjustable resolution and frame rate means you can choose just the recording style you need to get the job done. Whether it be recording a normal conversation in high quality, or recording quick movements at a higher frame rate, this pen will have you covered. Easy one button operation. 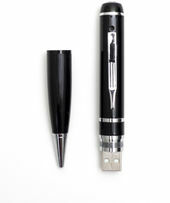 Press the top of the pen to immediately record digital video to the internal memory. Easily retrieve files by unscrewing the pen to expose the USB port and connect to a PC. Compatible with all operating systems. Compact built-in rechargeable battery. Delivers power for up to 1 hour on a full charge. Adjustable resolution and frame rate. Choose from 1080p @ 30 fps or 720p @ 60 fps for smooth high quality footage. Easy settings adjustment. The included software program makes it easy to change numerous settings such as resolution, time, sharpness, contrast, and time/date stamp visibility. *Frame rate will vary depending on lighting conditions and amount of movement in the frame.